This ingenious frag rack takes up less horizontal room in your aquarium leaving you more space for your reef. There are 24 holes each approx 12mm in diameter to cater for all common frag plug stems. 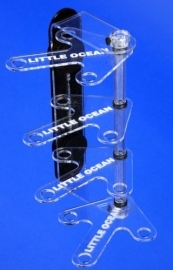 The branches of the frag rack set at different heights are ideal for acclimatising new coral frags or just positioning your frags ready for selling at their required light level. Each branch can be swivelled about its axis to ensure all frags get the needed level of light. Magnetic mounting system ensures secure attachment up to 10mm glass. Each plate has 6 holes and the rack has a total of 4 plates equally spaced. Each plate rotates 270 degrees about the axis giving huge flexibility in coral positioning.